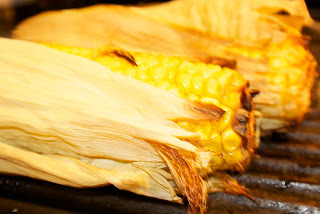 So it's raining outside, and grilling is not an option...is roasted corn on the cob out of the question? Not at all. Simply place corn ears directly onto a center rack in your oven (preheated to 350 degrees) for 30-40 minutes. Remove from oven, butter, and sprinkle with salt, pepper, and cayenne pepper. Enjoy!